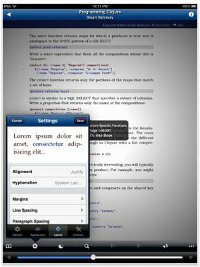 Stanza is one of the most popular and versatile free ebook reading apps ever made, but when Amazon bought out Lexcycle, the makers of Stanza, everyone assumed Stanza would see no more improvements, and that appeared to be true since the Apple iPad was released and no new high-def Stanza app was released . . . until now. Yesterday, an iPad version of Stanza was indeed released. Some new features include PDF, DjVu, and Comic Book Archive support, Turkish & Bulgarian translations, transfer books via iTunes by dragging files into the Stanza documents folder, open ebooks directly from web pages, and email attachments. You can read more about Stanza’s features by visiting this existing post on the free ebook reader page.